ABOVE: Patrons in parkas belly up to the Absolut Ice Bar in Stockholm's Nordic Sea Hotel. The Absolut Ice Bar in Stockholm, Sweden gives new meaning to the phrase "on the rocks." Drinks are served in fist-sized hollow ice cubes, and the barmaid plunks them down on a bar made of clear ice blocks. Stockholm's Ice Bar, which opened in 2002, is probably the most celebrated alcoholic attraction in Sweden. It drew 70,000 visitors in its first year, has been featured on the BBC and CNN, and has been frequented by such celebrities as Pierce Brosnan and Sweden's own Stellan Skarsgård. The bar's success prompted Absolut, the Swedish vodka distiller, to buy naming rights in late 2003. The rechristened Absolut Ice Bar was said to be "the first establishment in Icehotel's and Absolut's new joint global franchising concept," so who knows: An Ice Bar might be in your future even if you live in Freemantle or Phoenix. ABOVE: Claudia Quas of the Stockholm Visitors Board looks toasty and tantalizing in an Ice Bar cape. 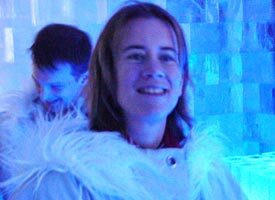 The Ice Bar is refrigerated to -5° C (23° F), so you'll probably want to pull up your hood (trimmed in white fluffy fake fur) and slip into your knitted gloves, which dangle from the cape like a preschooler's mittens from a snowsuit. You can now advance to the bar and order from the drinks menu, with choices that include cocktails made with flavored Absolut vodkas and fruit juices plus several non-alcoholic drinks. There aren't any bar stools (prising visitors' bottoms from ice blocks raises liability issues), but you can rest your elbows on the ice bar or ice tables if you can take the cold. If you're like most visitors, you'll probably split your time between drinking and snapping photos of your companions. After 20 or 30 minutes, you'll be ready to return through the air lock, hand over your parka, and maybe buy a white-on-white souvenir t-shirt on your way to the Nordic Sea Hotel lobby. ABOVE: Ice "glasses" await drinks at the Absolut Ice Bar in Stockholm. INSET BELOW: Paul Lasley co-hosts "On Travel" for CNN Radio and XM Satellite Radio when he isn't modeling polar fashions in Sweden. The Absolut Ice Bar is just off the main lobby of the Nordic C Hotel in downtown Stockholm. The hotel is on Vasaplan, a short east-west street between the Arlanda Express terminal and Vasagatan. The T-Centralen tunnelbana (underground) station is close by. The bar is open year-round, with hours varying by season. The cover charge, which includes warm clothing and one drink, is SEK 160 to 180, depending on the time of evening. Refills are SEK 85. Accompanied children under 18 pay SEK 50, which includes a non-alcoholic drink. 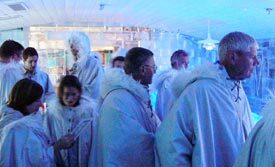 Although the Ice Bar supplies a cape-parka, mittens, and (if needed) protective footwear, I'd suggest wearing adequate clothing and shoes to avoid being chilled. Drop-in hours (no reservations needed) are 9:45 p.m. to 1 a.m. on Fridays and Saturdays; for other times, you should reserve in advance via the booking form, by e-mailing [email protected], or by calling +46 (0) 8-50 56 35 20. You save money by pre-booking, and guests of the Nordic C and Nordic Light Hotels receive a substantial discount. 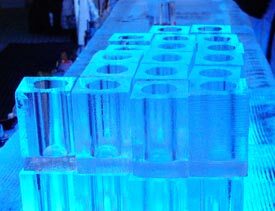 For up-to-date information, see the Absolut Ice Bar's Web site.